The Limelight is a bar/club geared towards indie/rock music fans. It has some of Belfast's best student nights. Plenty of live events so check their website for listings. A laid back club with a brilliant atmosphere and a cheap entry fee. Have you got Google Earth on your computer? If so, then download the Google Earth view of The Limelight. Is this the wrong position for The Limelight? If you think so, then modify its position. Click / Tap the button above to get directions from where you are to The Limelight. A loud, sweaty, dirty hole. I LOVE IT. Dingy, grubby, dirty, disgusting! Insert your own negative word for this horrible place! See people who complain about the Limelight? I don't get it. Shag on a tuesday is the best place to be during the week, the music is great, the staff are good craic and the drinks are kinda cheap? �£3.50 double vodka and red bull yumyum. Fridays in the Limelight are awesome as well, they've kept the "January sale" on and it's only �£1.50 a drink, which makes the �£5 door tax less horrible, and i dont see how you can resist that?! Also the bouncers do their jobs brilliantly and they're all lovely guys, apart from when they hit on you, but it must be boring standing at those doors all night LOL. All in all the limelight is great. (P.s make more hot boys go) < thats my only criticism LMAO. Agree 100% with Theresa. The bouncers are ignorant and horrible. The place has gone downhill royally in the past few years. Need new staff who have good customer service. 0/10!!!! Stay clear! Bouncers are so horrible! Can someone teach them some manners? No wonder the place isn't busy anymore! It's a good place, never been there and had a bad night. Very relaxed, I was completely hammered and still made it passed the bouncers last time (although it took all my acting skills). It's an alternative club obviously, but it isn't some dive filled with hippies and smelly people. I've never been on student night, just Friday and Saturdays so maybe on student night (Tuesday I think) it will be filled with more punks. Music is good, especially if you're into loud, jump around music. They also played a bit of MJ last time I was there, alongside Prodigy and such. Bar staff are alright, maybe a bit slow. Prices are HIGH at weekends but that's just stating the obvious. The £5 weekend entry fee is a pain too but you WILL have a good night out here! Dance floor maybe a bit small! just a point about requests - the dj aint a jukebox!!!!! I have to disagree with almost every point you have made. I've been going to limelight for about 4/5 years, and yeah they do throw in a few 'recennt' or 'charty' songs, but so what? you don't need to look likea pretentious idiot- just dance, who cares if there is a few crap songs- its always been like that, a few songs of whatever is popular at the time are played around 12/12.30!! The few less than brilliant songs are perfect getting beer/toilet time!. I have asked for YYYs many a times and its been played, along with plenty of other requests.But remember it is a nightclub,its his job to keep people up dancing so hes not going to play a specific song if he doesnt think a particular song will work. Also on your point of the bouncers, well again i totally disagree. Every time i have needed their help, they have been brilliant! Remember they are only human, with two eyes, they cant see everyone/everything. IF you see someone getting totally perved on, tell the bouncers!I did this to some guy who was being seriously out of line with my sister, and 3 of them threw him out. For all they know the molester/molestee may be together! Again the same goes for the incident you said about your friend, isnt it possible they though the friend tipping the glass was a stranger trying to start trouble? I love the limelight,awsome music, cheap drink, no dress code, noone cares, great atmosphere!! Keep your musical tastes to yourself please. What you think is bad music may not be an opinion that is shared with the rest of the Limelight's clientele. I adore Linkin Park and the Ting Tings and I'm certainly not "chavtastic folk". I'll agree that the bouncers aren't the friendliest but I have seen them watching the dancefloor closely and I've been told off once or twice for blocking the stairs. Trust me, they ARE doing their jobs. The thing you need to realise is that the Limelight changes with the times. If you loved it back in 2005 then don't be surprised that you don't love it 3 years on if you don't like the culture change that has occured since. 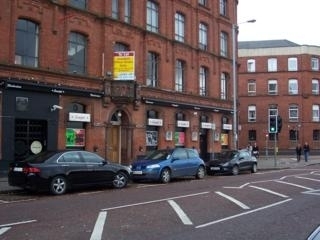 It's personally my favourite place to go for a night out in Belfast. The atmosphere is great, the crowd are friendly and the drink is cheap. Enough said. I adore the Limelight, it's a great place for night out with your mates. No stupid dress code; you're only gonna look a state at the end of the night(in a good way). SHAG is great, the DJ is really dead on and always plays my requests. No steeky rave music! Cheap drink, nice staff especially in Katy's, what more d'you want? Amazin craic but me and my mates usually go to the Duke of York afterwards to chill out for abit before headin home. Love it. i'm 20 and i feel like an old fart in the place. kick the kids out! Limelight is kitted out with all the neccassary ingredients to mix up a great night! Not to mention a consistently good sound from the many up-and-coming local bands! always have fond memories of 'the slimers.' great bar, no-hassle with anyone, although the drink tastes a bit watery at times... good for wimin. The Limelight rocks!!! Since leaving uni in belfast it is the one place I miss the most and try to get back to as often as I can. If you're looking for a great night out with cheap drink, brilliant craic and class music, not to mention the excellent bands that have played there, you can't go far wrong with the limelight! Unless you're a poser who doesn't like to get sweaty and unkempt. You lot can stay away.I love the Limelight!!!!!!!!! !